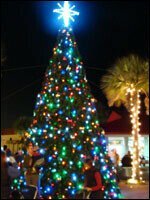 A date has been set for the annual Christmas Tree Lighting Ceremony in Sandy Point. Medical Officer, Dr. Norgen Wilson and the Staff of Pogson Medical Center are inviting the Sandy Point Community to the tree lighting ceremony on Wednesday 16th December, 2009. It starts at 6:00 P.M. and will take place on the grounds of the Pogson Medical Centre. It will be the first lighting ceremony since the official opening of the new medical facility. Meanwhile, Dr. Wilson has also issued an invitation to all the children of Constituency #5 (Sandy Point and Fig Tree) to attend the annual Kiddies’ Christmas Party on Thursday 17thÂ December, 2009 from 2pm at the Sandy Point Community Centre.